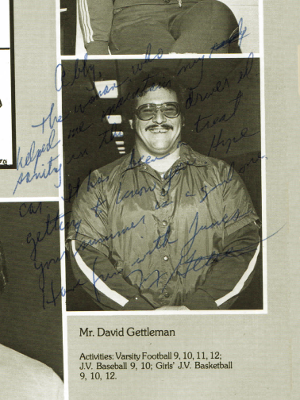 In my 1979 High School yearbook, David Gettleman, past (very recent past, sadly),General Manager for the Carolina Panthers writes, ‘To the woman who helped me maintain my sanity in the Driver’s Ed car, it has been a treat getting to know you.’ Gettleman was our High School Football Coach and my Driver’s Ed teacher at Spackenkill High School in Poughkeepsie NY. He was a popular teacher, tough on his football players, and committed to helping teens be responsible drivers. Master the basics first. Ignition, seatbelt, surroundings, accelerate, brake, signal. Gettleman never let us leave the parking space without covering the basics. What are the basics in your business? Have you mastered them? Create healthy habits through disciplined practice. Gettleman reminded us of the rules of safe driving every single class. By the end of the semester, we did them without thinking. Do you even remember your own drive to work this morning? What healthy habits do you need to create? What power would you have if you could do it without even thinking? Build depth and breadth in your field by practicing more complicated maneuvers like parallel parking or three point turns. Gettleman invested hours with us practicing parallel parking. When we insisted we would never need to parallel park, he reminded us that the skills learned in parallel parking made you a more masterful driver. Where do you need to build depth and breadth so you can have mastery in your field? Anticipate risk. Gettleman said if we learned to drive defensively, we’d be better prepared for the unexpected, and better able to handle it when it inevitably shows up. We spent time understanding the risks and hazards encountered when driving and how to handle them. As a result, we were better prepared. What risks should you anticipate in your business, in your industry and how can you create a defensive strategy? These four simple lessons from David Gettleman and his approach to Driver’s Ed provide a solid foundation for responsible driving, and for responsible business. Thank you, Gettleman and Go Panthers! One of my biggest pet peeves is spending hours and hours in meetings, debating and discussing big important issues, or hashing out small important details and then leaving the meeting without crystal-clear commitments on Who Will Do What By When? If you find yourself frustrated with this same problem, you’ll really benefit from reading, Who Will Do What By When?, by authors Tom Hanson and Birgit Zacher Hanson. The book is a practical, tested How-To Manual on how to build an accountability system in your organization. Does your organization experience these common “accountability” traps? The carrot is often used to entice people to do their jobs. It includes sweetening the pot, asking nicely, begging, making promises of good things to come if the work gets done and meets expectations. For those choosing not to be accountable, this approach often fails. They just ignore the kind requests and go about their day. The stick is used to beat people up for not doing their jobs. Usually, after using the stick, the manager justifies it was warranted, and may even feel good about exerting his/her power, but the result is often an aggressive or passive aggressive response. Behaviors are driven underground, internal coalitions are formed, and backstabbing becomes a survival mechanism...And there are still missed deadlines, underperformance, or incomplete work. The twizzle, a name I coined myself, is used when the manager is faced with a series of well-crafted excuses. A good manager may be able to knock down the first, or even second attempt at an excuse, but someone good at the twizzle can offer many long, complex, logical and seemingly justifiable explanations for not getting the work done. Some are adept at redirecting the conversation towards another seemingly bigger issue. As a result, the employee effectively abdicates all responsibility. When the twizzle is used, the manager may feel effective because he or she can hear and even understand some of the explanations, and the excuse-maker probably feels justifiably vindicated, but the work is still not done. One of the most damaging components that can show up in any and all of these methods is when the conversation ceases to be about the business need and becomes personal. 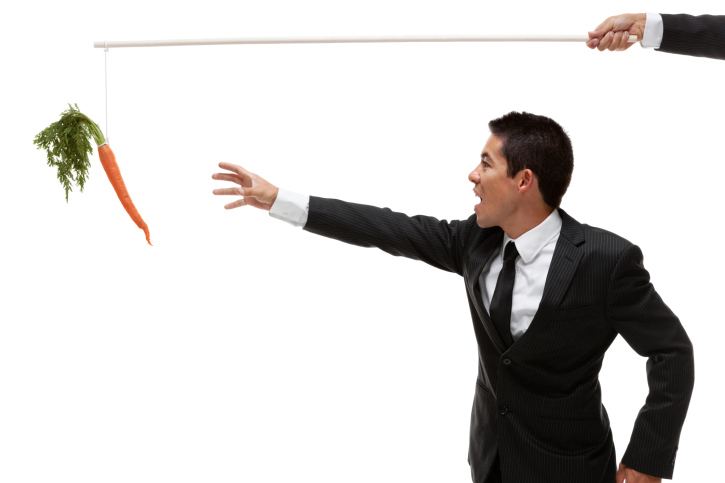 Asking someone to do you a favor (carrot) rather than focusing on the business need to deliver makes it personal. Beating someone up (stick) often turns personal as it focuses on weaknesses or judgments. Excuse-making can be made personal (twizzle) with excuses like, ‘I didn’t feel well; it’s not my job; Joe didn’t get the report to me on time; etc...’. In this wonderful book, Who Will Do What By When, managers learn how to really manage accountability well. They learn how to set clear expectations, explain the compelling business need – the WHY behind the job expectations, and help the team understand the business consequences of not delivering results. If you want to create a highly accountable and effective workforce, read and apply the framework in this book. It’s a refreshing read and a straightforward approach that can be reapplied time and time again. Where do you need to hold people more accountable?